Tour beautiful Banderas Bay, passing the panoramic views of the Sierra Madre, the Puerto Vallarta skyline, and the set of Night of the Iguana in Mismaloya, on your way to the remote hideaway of Yelapa. There are no roads in Yelapa, the only access is by boat. Electricity was only introduced to the area three years ago! On board the boat, enjoy a continental breakfast, the famous Pegaso guacamole and salsa, and of course the open bar. Stop at one of the snorkeling spots, grab your gear, and chase after tropical fish. 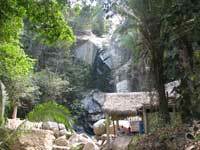 Enter the cove of Yelapa and follow our guide as you visit the major sites, including the beautiful Yelapa waterfall, while listening to stories of the remote village and its people. After the tour, head to the beach, where you will have lunch at one of our favorite beach restaurants and have a chance to relax on the beach, or enjoy some of the optional beach activities in Yelapa, such as banana boats, kayaks, horseback riding, or parasailing. 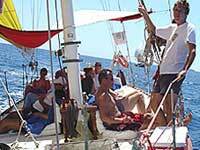 Climb back on board our classic sailboat and enjoy a wonderful sail (conditions permitting) back to Puerto Vallarta. For those who want a great combination of boating, snorkeling, exploring, and beach, this is the tour for you! Runs: Mondays and Thursdays at 8:00 AM from Nuevo Vallarta or 9:00 AM from Marina Vallarta. Includes: Continental Breakfast, Snack, Lunch at a beach restaurant (including one drink), Open Bar on the boat, Soft Drinks, Sailing (conditions permitting). Departs From: Paradise Village Marina in Nuevo Vallarta, and the Opequimar Marina in Marina Vallarta. Directions will be provided with your confirmation.